I have recently contributed to a proof of concept study published in the prestigious Nature Communication Journal (doi:10.1038/s41467-018-03931-4) . The study involved collaborations with experimental groups across University of Lincoln (UoL), University of Molise (Italy) and the Royal Holloway University of London coordinated by Dr. Enrico Ferrari (UoL). The motivation for this is that, generally, the high diversity of protein properties necessitates the development of unique nanoparticle bio-conjugation methods, optimized for each different protein. Enrico had the smart idea to design a universal bio-conjugation approach which makes use of a new recombinant fusion protein combining two distinct domains. For this purpose, the N-terminal part is Glutathione S-Transferase (GST, a protein ubiquitously present in both eukaryotes and prokaryotes with the ability to catalyze the conjugation of the reduced form of glutathione (GSH) to xenobiotic substrates for the purpose of detoxification) from Schistosoma japonicum was bound covalently bound to gold nanoparticles (GNPs) by gold-sulfur bonds. The C-terminal part of this multi-domain construct is the SpyCatcher from Streptococcus pyogenes, which provides the ability to capture recombinant proteins encoding a SpyTag (see Figure 1). Figure 1: Crystal structure of the SpyCatcher/SpyTag complex (PDB code: 4MLI). The image was created using the Chimera software. In this work, it was shown that Spy- Catcher can be immobilized covalently on GNPs through GST without the loss of its full functionality. We then show that GST-SpyCatcher activated particles are able to covalently bind a SpyTag modified protein by simple mixing, through the spontaneous formation of an unusual isopeptide bond. In this paper, Molecular Dynamics (MD) simulations have been used to study the absorption of the protein on the surface of the gold nanoparticles coated with citrate molecules. In the simulation, the nanoparticle surface is approximated as a flat gold surface. An atomistic simulation of the entire particle would be challenging since the NP used in the experimental study (~40 nm in diameter) is too large (only the NP would consist of 2 millions of atoms, see Figure 2). Figure 2: A 40 nm particle compared to the size of the GST protein. If not differently indicated, all the pictures on this blog have been generated using the VMD software. Gold nanoparticles are easily produced by reduction of gold salts in the presence of a citrate solution whose concentration determines the diameter of the nanoparticle. The citrate molecules absorbed on the nanoparticle surface negatively charge it. To reproduce this effect, the gold surface used for the MD simulation was prepared by letting citrate molecules to be absorbed on it. In this way, the citrate molecules in complex with Na counterions coat the gold surface as a molecular quill (see Figure 3)! Figure 3: planar (10×10 nm) Au layer with citrate molecules absorbed used in the simulations. 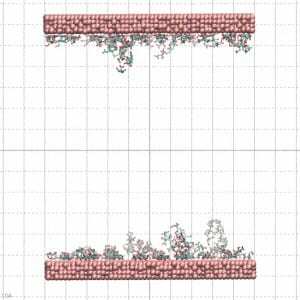 The result of the simulations clearly indicates the tendency of the protein to bind the coated layer driven by electrostatic interactions with the negative carboxylates of the citrate with the side chain of the arginine residues on the protein surface. 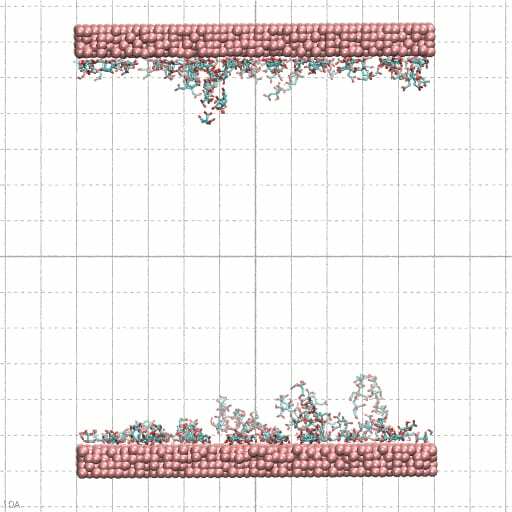 In Figure 4, conformations of the protein bonded to the layer at the end of three 20 ns simulations starting from different velocities are shown. The results support the experimental finding on the possible mechanism of absorption of the protein on the nanoparticles. Ma, A. Saccardo, D. Roccatano, D. Aboagye-Mensah, M. Alkaseem, M. Jewkes, F. Di Nezza, M. Baron, M. Soloviev, E. Ferrari. Modular assembly of proteins on nanoparticles. Nature Communication.9, 1489 (2018). All these studies evidenced that simple but powerful mathematical properties and geometric forms are recurrently used by Nature in the shape of organisms, and other natural objects and environments. You can find the golden ratio, the Fibonacci number, spirals shaped forms, and fractals everywhere even in your home garden. In this presentation, I made an overview of the different pattern observed in Nature from a mathematical and geometric perspective. In the first, I focused the attention on the mathematical properties of the golden ratio and Fibonacci sequence exploring its relation with the plane and spatial geometry and with the number theory. In the second part, an overview of the concept of fractals with some examples of applications are provided. Peptides are versatile molecules with applications spanning from biotechnology to nanomedicine. They exhibit a good capability to unbundle carbon nanotubes (CNT) by improving their solubility in water. Furthermore, they are a powerful drug delivery system since they can easily be uptake by living cells, and their high surface to volume ratio facilitates the adsorption of molecules of different nature. Therefore, understanding the interaction mechanism between peptides and CNT is important for designing novel therapeutically agents. 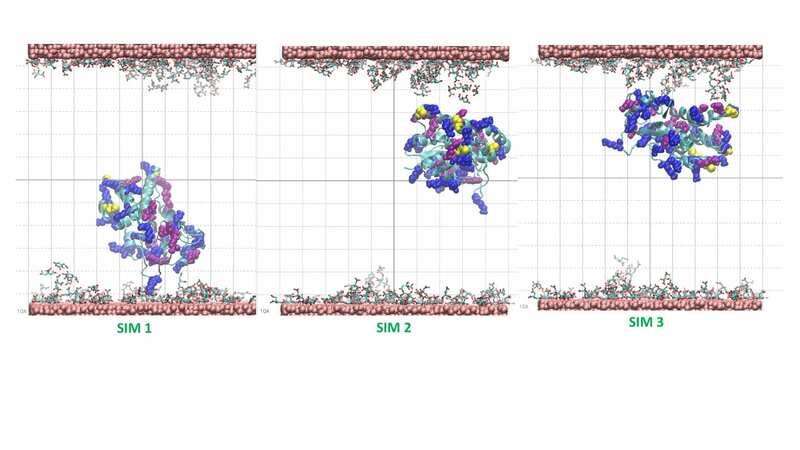 In this paper, the mechanisms of the adsorption of antimicrobial peptide Cecropin A – Magainin 2 (CA-MA) on a graphene nanosheet (GNS) and on an ultra-short single-walled CNT are characterized using molecular dynamics simulations. The results show that the peptide coats both GNS and CNT surface through preferential contacts with aromatic side chains. The peptide packs compactly on the carbon surfaces where the polar and functionalize Lys side chains protrude into the bulk solvent. It is shown that the adsorption is strongly correlated to a loss of the peptide helical structure. In the case of the CNT, the outer surface is significantly more accessible for adsorption. Nevertheless when the outer surface is already covered by other peptides, a spontaneous diffusion, via the amidated C-terminus, into the interior of the CNT was observed within 150 ns of simulation time. We found that this spontaneous insertion into the CNT interior can be controlled by the polarity of the entrance rim. For the positively charged CA-MA peptide studied, hydrogenated and fluorinated rims, respectively, hinder and promote the insertion. Citrate Synthase (CS) is an enzyme localized in the mitochondria of our cells where it plays an important role in the aerobic respiration cycle by transforming oxaloacetate molecules (on the right side of the picture) in citrate (on the top left side) with the assistance of the acetyl-coenzyme A (CoA) molecule. As the pac-man in the famous computer game, this Pac-Enzyme diffuse along the space between the convolute cristae of mitochondria “chomping” at its encounter oxaloacetates that activate the enzyme to bind the CoA (ghosts in the playground). For each captured CoA, a new citrate molecule is then produced (score). This complex mechanism requires large conformation changes of parts of the protein (domains) whose molecular details are not yet clarified. Using molecular dynamics simulations on the ARCHER supercomputer, I am studying in collaboration with Dr. S. Hayward of the University of UEA (Norwich, UK) this enzyme to garner novel insights on structural, dynamics and thermodynamics of its functional mechanisms. and it was selected for the September picture in the ARCHER calendar 2017. In my recent public talk at the Gravity Fields Festival 2016, I have shown several models of molecular machines, I have added some of them to this blog with the details on their construction. The models have been generated using a small script in awk language and represented using the program VMD (http://www.ks.uiuc.edu/Research/vmd/). The photosynthetic apparatus of purple photosynthetic bacteria is particularly simple and it is located in a specialized membrane system that develops in the bacterial cytoplasm. They are composed of four integral membrane protein complexes: a peripheral LH2 antennae complexes that serve to collect light and transfer the absorbed energy to the second complex, the core-complex, which is constituted of an antenna complex (LH1) associated with the photochemical reaction center (RC). The LH1 serves to funnel the light energy to the RC where a charge separation takes place catalyzing the oxidation of a water soluble carrier. 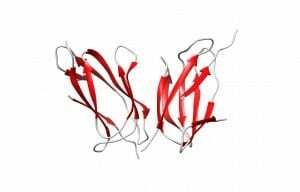 The different crystallographic structures of these components are available in the Protein Data Bank. Based on the supramolecular assembly of these proteins observed using Atomic Force Topographic (Scheuring et al. 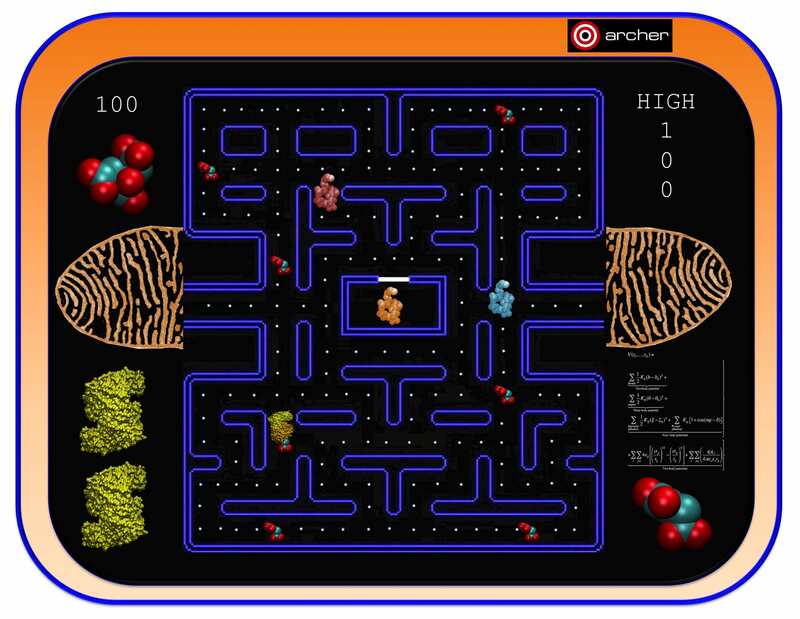 2007), it was possible to generate a molecular model of the photosynthetic apparatus of Rsp. photometricum. The model comprises one RC-LH1 core complex surrounded by several LH2 complexes. The model is a chimera of crystallographic structures from different organism. In particular, for the LH2 was used the nonameric Rps. acidophila structure [PDB id: 1KZU (McDermott et al., 1995)]. 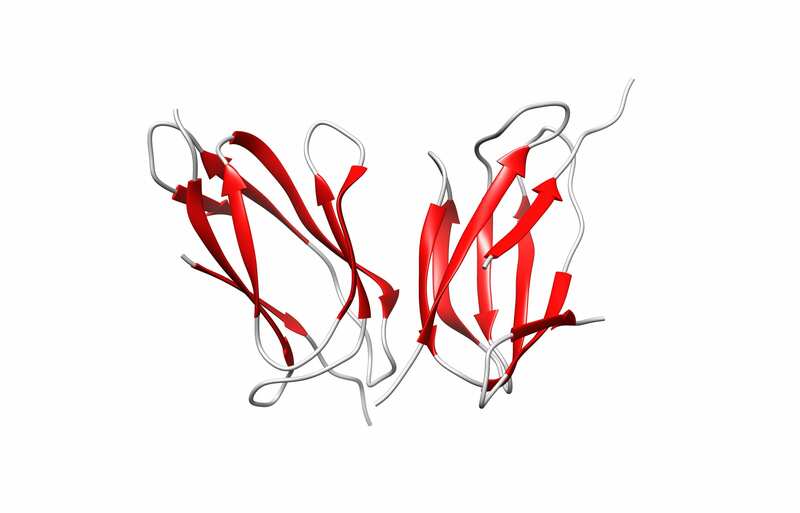 The LH1-RC complex is based on the recent crystal structure from Thermochromatium tedium [PDB id: 4V8K (Niwa et al. Nature, 2014)]. 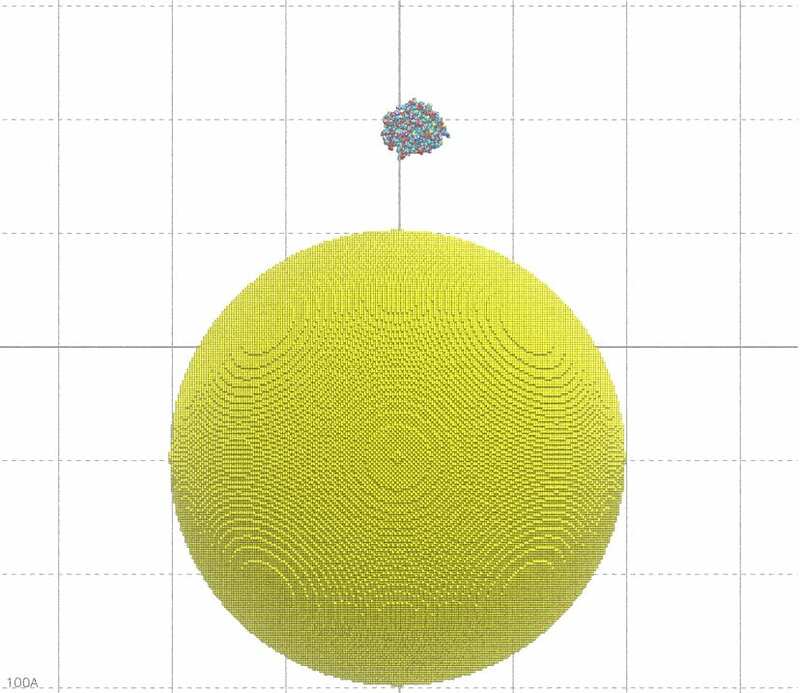 LH2 and the core complex were first centered and aligned and then translated and rotated to their relative positions using as reference the AFM topography reported by in Scheuring et al. 2007. A DPPC lipid bilayer was also generated using the tools in the VMD program and added to the model by removing the lipid molecules overlapping with the proteins. Two views of the model are reported below. The complete fly-by animation is here. Vacuolar-ATPase (V-ATPase) is an ancient enzyme with remarkably diverse functions in eukaryotic organisms. It is used to acidify different organelles and as a proton pump across the plasma membranes of numerous cell types. For its functions, V-ATPases use the energy produced by ATP hydrolysis. It is generally seen as the polar opposite of ATP Synthase that uses the energy from a proton gradient to produce ATP. The structure of the model of the Yeast V-ATPase was generated by Zhao et al. using electron microscopy add homology modeling (PDB Id: 3J9U, Zhao et al. Nature, 2015). I have just generated a DPPC lipid bilayer using the tools in the VMD program and just added to the model by removing the lipid molecules overlapping with the proteins. A view of the model is reported below. The complete fly-by animation is here.